Hopper-Top Diverter Valves are used when customers need to fill multiple bins from a common source. They offer a reduction in cost by allowing convey air to be routed to a remote source, thereby reducing the required number of filters in a system. This reduction in filters often reduces capital costs, decreases the number of air emissions permits required and/or reduces head height required at the destination. Hopper-Top Diverter Valves work by placing a divert mechanism that pivots open or closed into the convey stream. When opened, the divert mechanism allows product to flow into the bin on the “front” side and the convey air to escape the bin and configure down the “back” side to another bin or a remote filter. When closed, the bin is bypassed altogether in favor of another bin for filling. 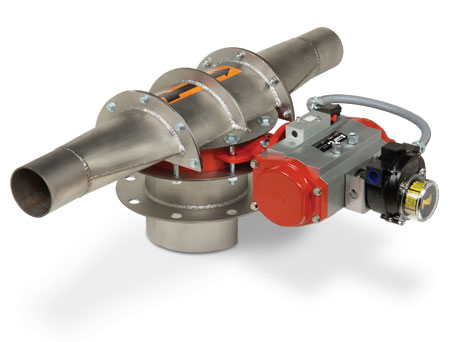 The Magnum Systems Series II Hopper Top Diverter Valve is based around a simple concept. A resilient seated butterfly valve is placed into service with fabricated transitions around it. When actuated, the butterfly disc diverts product. When closed, the resilient seat provides a dust tight closure. There are no dead pocket areas for product to accumulate.